Island of Lost Souls is a masterpiece of '30s horror. Filled with dank jungle settings, dark caves, and huge mutant plants, Island of Lost Souls percolates with a decadent atmosphere that charms while it also horrifies. With director Erle C. Kenton at the helm--who was mostly just a journeyman director with several '40s Universal monster bashes to his credit--the island becomes a sinister, vile environment of creeping shadows that infiltrate right into the souls of the characters on screen. 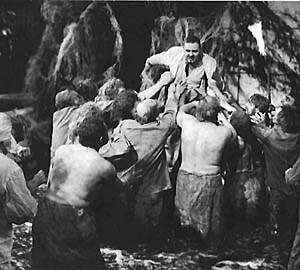 Charles Laughton faces his creatures in Island of Lost Souls. 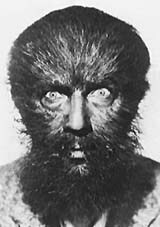 Richard Arlen plays the shipwrecked Edward Douglas, abandoned much to Dr. Moreau's initial dismay on his South Seas island. Moreau (Charles Laughton) doesn't want any prying ones on his jungle paradise where he conducts medical experiments on animals, but he quickly sees that Douglas could serve a useful purpose. Moreau leads Douglas around his island, cracking a whip to scare off hulking vaguely-human brutes who leer from the shadows, and introduces him to his daughter, the exotic and strange Kathleen Burke. Moreau immediately arranges for them to share lots of time together. Meanwhile, horrific screams split the night air and the creatures cower while bleating "The House of Pain!" Based on H.G. Wells' classic tale of horror, Island of Lost Souls easily holds it own against the remakes. In 1977 director Don Taylor remade the story with its original title,The Island of Dr. Moreau, but the results were largely mixed, with the lush, brooding atmosphere of the original replaced by beautiful, tropical paradise settings. Laughton's performance as Dr. Moreau easily outpaces both Burt Lancaster in the 1977 version and Marlon Brando in the recent release. Laughton's Moreau takes a sadistic glee in his enterprise, eagerly pushing the shipwrecked Edward Douglas together with the almost-human panther woman in hopes that Douglas and she might just sire a child. He waits in the shadows, carefully underplaying his part for the most part, while watching his plot take form. His eyes take on a sparkling glee. Laughton's performance is one of the great performances in the history of screen horror. In addition to Laughton's performance, Island of Lost Souls boasts the marvelous cinematography of Karl Struss, one of the great cinematographers of Hollywood, a wonderfully campy performance by Bela Lugosi as the "sayer of the law," who chants "What is the Law?" to the other beasts and a goofy, but creepy bunch of barrel-chested beast men. One of the beasts in particular, practically starts to salivate when he sees Douglas's fiancee arrive on the island. In one delightfully decadent scene, he climbs a tree so he can crawl through a window and into her bedroom. One of the great failures of the recent remake comes in the scene where the creatures finally turn on Moreau. I won't give away what happens, but in the Brando version, the scene is over all too quickly. While in the original, director Kenton and cinematographer Struss create a horrific vision that is bound to stay with you for years to come. It's one of the great scenes in the history of horror cinema. Island of Lost Souls is available on video from MCA/Universal Home Video. Photo Credits: MCA/Universal Home Video.